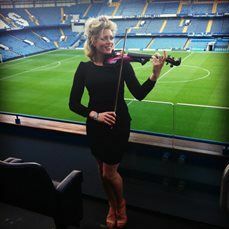 Make your event unforgettable, book Lettice Rowbotham & Fenna to perform at your event – we are a booking agent for Lettice Rowbotham & Fenna, and can arrange for them to perform for your guests. 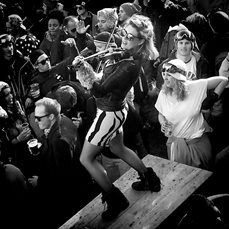 Violinist Lettice Rowbotham and Producer/ DJ Fenna Rhodes performed for the first time together at Glastonbury, where they electrified the crowd and discovered a unique chemistry. 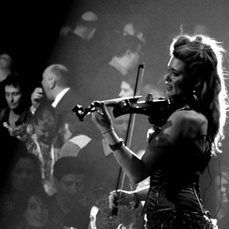 Lettice Rowbotham has performed as a solo violinist and with famous bands and DJ’s all around the world. From Radio 1 live lounge in Maida Vale, being a finalist in Britain’s got Talent, with residences at La Folie Douce in Val D’Isere & The Arts Club in Dover Street, palaces in Venice, to the beaches of Barbados… there’s no style of music or stage she can’t tackle and no audience she can’t entertain. Fenna has performed over 1000 shows around the planet from Fortresses in Transalvania, to Trafalgar Square, Lovebox, Parklife, with residencies in Camp Kerala, Verbier and across his home town of London . He has produced and released 3 albums with various artists and a host of singles and remixes in a broad range of styles from Funk & Dance, to Hip Hop , Soul , and DnB. 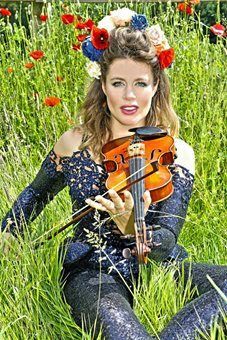 Having recently performed at The Queen’s 90th Birthday celebrations, Lettice Rowbotham & Fenna are working on new material together and making sparks fly with their explosive live show around the world. Contraband is the UK’s top booking agent, with affable, skilled account managers who guarantee you the best deal possible. Contact us today if you would like to book Lettice Rowbotham & Fenna to be the headline of your event! We as your booking agent are more than happy to help you create the most memorable moments with Lettice Rowbotham & Fenna.